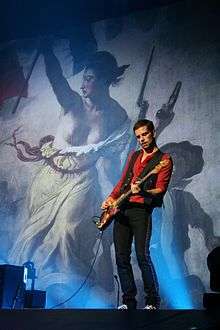 Guy Rupert Berryman (born 12 April 1978) is a Scottish musician, multi-instrumentalist and producer, best known as the bass guitarist for the bands Coldplay and Apparatjik. Berryman is left-handed but plays the bass right-handed. Berryman started an engineering degree at University College London (UCL). Soon after, he dropped out of his engineering course and switched to a seven-year architecture program at The Bartlett (UCL's school of architecture). He dropped out of his architecture degree after one year to focus on playing bass with Coldplay. While his bandmates were still continuing their degrees, Berryman worked as a barman in a local London pub. During the Twisted Logic Tour for the promotion of Coldplay's third album, X&Y, Berryman took candid pictures of the band with disposable cameras and threw them to the audience. Berryman owned a clothing shop called "Jezebell" in London, which closed down due to debt. On 7 June 2010, The Sun reported that Berryman and his brother Mark would be forming a company dealing with antiques. Berryman was born in Kirkcaldy, Scotland. He was educated at two independent schools: at The Edinburgh Academy in the city of Edinburgh in Scotland, and at Kent College in the city of Canterbury in England, before attending University College London. In 2004, Berryman married Joanna, his childhood sweetheart, in a low key ceremony in the City of Westminster. The couple have one daughter, Nico, born 17 September 2006. In March 2007, Coldplay's spokesman confirmed that Guy and Joanna separated after three years of marriage, and later divorced. Berryman is now engaged to Dutch model Keshia Gerrits. Berryman is an avid marathon runner and likes to run in the nearest parks or around the neighbourhoods of the hotels whenever the band is touring. He also has an interest in photography, fashion and electronic gadgets. He is a fan of his local football team Raith Rovers F.C.. Berryman owns a vintage retro style juke box and collects Motown and Stax 7" singles to play on it. He jokes that he knows "every secondhand vinyl shop in every major U.S. city". Berryman once said to have been starstruck by James Brown in concert. According to an article released by MSN UK in April 2008, Berryman has an estimated wealth of £25 million. 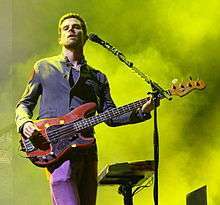 Berryman performing during Coldplay's 2008 Viva la Vida Tour. In 2004, Berryman (and Will Champion) collaborated with Magne Furuholmen of a-ha, Berryman's musical hero, on his solo album Past Perfect Future Tense, playing in the song "Kryptonite". In 2008, Berryman participated to the Movie Soundtheme of Umi no Shanghai. He also played the bass guitar on Furuholmen's second album, A Dot of Black in the Blue of Your Bliss. In the same year, he started collaboration with Magne Furuholmen, Jonas Bjerre (of Mew) and Martin Terefe under the band name of Apparatjik, working on a musical theme for the BBC2 series, Amazon. The theme was made available along with exclusive tracks from various other artists on the Survival International charity album, Songs for Survival. Apparatjik has made their very first live performance at the eleventh edition of club transmediale, an annual festival in Berlin, which took place between 28 January and 7 February 2010. Apparatjik performed inside a specially constructed cube at the WMF on Monday, 1 February 2010. On the same day, the band released their debut album, titled We Are Here. In 2010 and 2011, Berryman produced The Pierces' new album, You and I, together with Coldplay's producer Rik Simpson. Apparatjik's second studio album, Square Peg in a Round Hole, was released digitally in November 2011 and physically in March 2012. Berryman was credited with providing photographs for the inner sleeve of the album Foot of the Mountain, released by Norwegian pop/rock band a-ha in 2009. ↑ "Coldplay's Guy Berryman wants to be an antiques expert". The Sun. London. 7 June 2010. ↑ Killkelly, Daniel (12 May 2007). "Coldplay star splits from wife". Digital Spy. Retrieved 2008-07-11. ↑ Montgomery, James (2 October 2006). "No Five-Year Hiatus For Coldplay – But They Are Taking A Break". MTV News. mtv.com (MTV Networks). Retrieved 2008-10-14. ↑ "Coldplay to take hiatus?". Ireland On-Line. 2 October 2006. Retrieved 2008-07-11. ↑ Taylor, Chris (12 May 2007). "Coldplay Star Splits With Wife". Entertainment Wise. Retrieved 2008-07-11. Coldplay bassist Guy Berryman has split from his childhood sweetheart wife Joanna just six months after the birth of their first child. ↑ "A-Ha Guy's an Eighties baby". The Sun. London. 18 September 2008. Retrieved 14 March 2010. COLDPLAY bassist GUY BERRYMAN has formed an offshoot new band with his musical hero, guitarist MAGNE FURUHOLMEN of Eighties pop champs A-HA. ↑ "Coldplay and A-ha team up". Teletext. Retrieved 2008-08-22. ↑ Archived 18 June 2009 at the Wayback Machine.